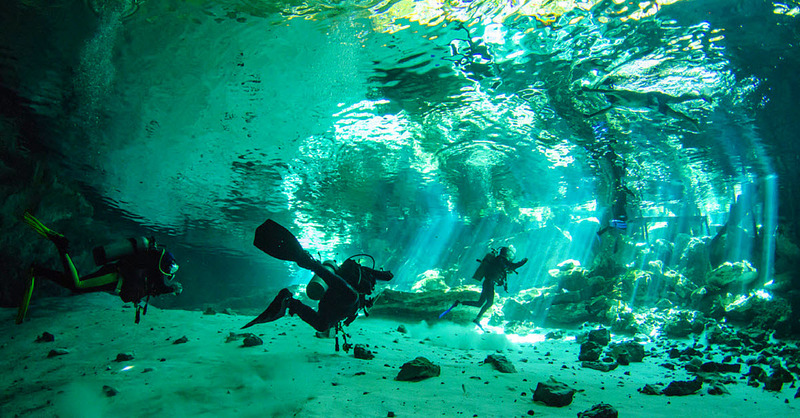 The Yucatan Peninsula is noted for its famous and spectacular underground rivers, that form a vast labyrinth of passageways and tunnels, flooded with amazing crystal clear water and connected to the exterior through the "cenotes". The cenotes are fresh water pools, the entry or window to the magic underwater marvels found only here in the Yucatan Peninsula. The Riviera Maya, an area situated between Cancun and Tulum, holds many of these windows, that allow us to enjoy these unique places. Fresh water, excellent visibility, stalactites, stalagmites and columns of unimaginable shape and size as well as light effects that will dazzle your imagination are some of the many reasons to dive and snorkel in the cenotes. Many cenote dives allow divers to experience the halocline, the boundry where the shallower fresh water on the top mixes with the sea water below resulting in amazing mirror and light effects. Cenote Xperience invites you to dive and enjoy the most decorated submerged cave systems in the world, where the incredible water clarity and the magical play of light on the multi-coloured limestone is BREATHTAKING. Millions of years ago, the Yucatan Peninsula was a huge reef covered by the ocean water. It looked very similar to what we see when we are diving off of the coast here today - lots of coral reef, coral caves, coral swim and marine life. During the last ice age, the level of the ocean dropped, exposing the reef to the climate and time. The coral died and the jungle started growing over the thick limestone platform created by the coral reef. Fossils found inland are the best proof of this and are commonly seen during a cavern dive. In time, the rain mixed with the carbon dioxide in the atmosphere, forming a weak solution called carbonic acid. The carbonic acid began to work its way through the porous limestone, carving holes in the soft limestone and creating a long network of passageways and tunnels. The dissolved limestone started filtering and dripping into dry passages over thousands of years, forming amazing cave decorations of stalactites, stalagmites and columns. After the last ice age, the melting ice raised the ocean back to today's current level, submerging the cave systems in water. Caves with ceilings higher than sea level were partially flooded, leaving some remaining air space. Some of the partially air filled cave ceilings became too thin to hold their own weight, collapsing and creating sink holes or natural windows as entrances to the underground river system. Cenotes were the only source of water in the jungle for the Mayan civilization and to this day are considered sacred by the Mayan people. The Mayans believe cenotes to be an entrance to their "underworld" where their gods live and their spirits reside after death. The Mayans first called these sinkholes "Dznot" or sacred well. The word had been changed into "cenote" by the Spanish conquerors.